Angela Delfini Explains It All For You. Oct 4-7, 2018 in Chicago. Directly from the New York Clown Festival, Italian clown Angelina Delfini is taking her show (along with her director John Towsen) on the road to Chicago for a one week set of workshops and performances at the PROP Theatre. The show features Delfini as both a psychiatrist and her subject. As a psychiatrist Delfini plays (surprise surprise) Dr. Angela Delfini, personality pioneer. She also plays her subject, Estrella. In a 5 step recovery process, using circus, clown, dance, physical comedy, and the power of the audience, Delfini explores the power of humor, self-transformation, and the re-definition of self in what is apparently a very funny 60 minutes. I haven’t seen the show yet, but I know John, and I am sure that the show (and the 3 day workshop that precedes it) will be great! Angela Delfini performs Oct 4-7, gives workshop Oct 1-3. The show will appear at the Prop Theatre Oct 4-7, and prior to that Angela and John will give a 3 day workshop Oct 1-3 in the evenings. The workshop is on physical comedy, and John and Angela are team-teaching it. 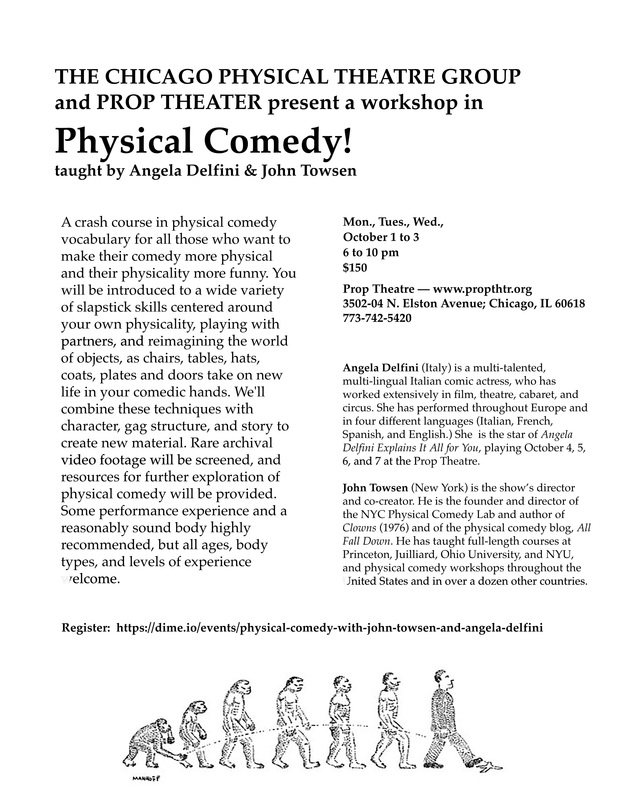 To register for that workshop, visit https://dime.io/events/physical-comedy-with-john-towsen-and-angela-delfini or you can look at the Workshop flyer. Workshop with Angela Delfini and John Towsen runs October 1-3. Angela’s training and performance career have spanned theatre, film, dance, and clown. She is best known for her work in Italy with the Cinema-Theatre of Marciel, and in France with the Ploum Company of Marc Hollogne. She also teaches clown and performs comedy numbers in the streets and in cabarets. John is the author of the classic book CLOWNS and the joke compilation book How Many Surrealists Does It Take To Screw In A Lightbulb , as well as the excellent physical comedy blog ALL FALL DOWN. John was one of the founders of the first NY International Clown-Theatre Festival in the 1970’s. He began his performance career at the age of 7, and six decades later is still writing, teaching and directing, as well as running the New York City Physical Comedy Lab. Here is a video promo of the show from Youtube. See more photos of her show in NY and a video interview about the making of the show on Jim Moore’s excellent blog Vaudevisuals. Sunday Oct 7 at 4 pm. Tickets are $15 each and available here.